DISCONTINUED. 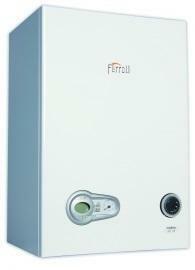 The i25 Combi gas boiler from Ferroli is a highly reliable, wall-mounted combi gas boiler. This model has an output of 25kW and an efficiency rating of 96.5% making it an A rated boiler. A 29kW model is also available. This boiler is a lightweight and compact boiler which makes it easier and possibly cheaper to install. There is a wide range of optional accessories such as the wireless remote thermostat as well as a choice of a digital or mechanical timer. This boiler includes a high efficiency pump and is available as a natural gas boiler or LPG. Smart controls are user friendly and the control panel comes with a backlit display with push button controls for easy adjustment. You can easily manage the temperature of both your central heating and hot water for greater comfort and convenience. This boiler includes a 2 year warranty as standard so you can be sure you're getting a reliable boiler.